Last year we began to offer the book "Marijuana Legalization: What Everyone Needs to Know" as an option for members donating $35 or more. This week it was announced that a policy firm headed by one of the authors of the book, Prof. Mark Kleiman, had won Washington State's contract to do analysis related to the implementation of I-502, and that the book's other authors would be part of that team. It was a big news item this week, on CNN and other outlets, and I blogged about it here and here. The discussion has included concerns reformers have raised about some of Kleiman's past statements about state legalization, and Kleiman's response to that. We continue to offer this book, as well as the other items we offered it together with: the book Drugs, Insecurity and Failed States: The Problems of Prohibition and the DVD Lynching Charlie Lynch. (Follow the links above for Drug War Chronicle reviews of each of these works.) I've found Kleiman et al's book to be pretty valuable, even while disagreeing with some things, and it certainly will offer some clues as to where they might go with their recommendations to the state. When those recommendations come out, we'll undoubtedly have some things to say -- reading the book would be a great way to prepare. Donate $35 or more to StoptheDrugWar.org and you will be eligible for a complimentary copy of "Marijuana Legalization: What Everyone Needs to Know" or one of the other items. Donate $65 or more and you'll be eligible for any two. Donate $95 or more and you can receive all three. Other offers we've announced continue to be available too. At a time like this -- when people are talking about drug policy like never before -- the movement's internet strategy is also more important than ever before. So please support our work with a generous donation by credit card or PayPal today. You can also donate by mail or give stocks -- info below. Thank you for supporting the Drug War Chronicle newsletter and StoptheDrugWar.org's work engaging the debate at this pivotal time in drug policy reform. StoptheDrugWar.org needs your help to continue our programs -- like this newsletter, Drug War Chronicle -- during the most important time in the drug reform cause that there has ever been. Click here for some examples of how activists around the world rely on Drug War Chronicle in their work. As our thanks for your support, we continue our full set of membership offers, some of them available with donations of $15 or greater to our organization. Though we offer these items for $15, I hope you will consider making a larger donation if you can, or supplementing your initial gift with a monthly one. If the gifts are not important to you, I hope you'll consider sending a donation that's just for our work. We are pleased to launch a new membership offer -- and continue several older but good ones -- for supporters making donations of $15 or greater to our organization. I am writing to ask your support as we head into the new year. The nation's continuing economic challenges present nonprofits with continuing challenges, even in drug policy reform despite the excitement of last month's victories. StoptheDrugWar.org, and the widely read, widely put to use Drug War Chronicle newsletter, need your help to continue in strength into 2013. Would you visit our web site today to make a generous donation to our work and the cause? 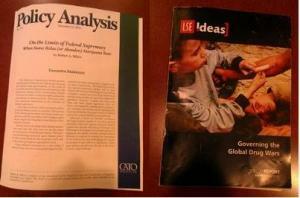 Of course publishing information is not all that we do here. We also play important roles in generating grassroots support for legislation, recruiting organizations onto legislative sign-on letters to Congress organized by DC-based criminal justice reform coalitions, speaking with the media and more. This fall we held our first member teleconference, featuring representatives of the three legalization initiatives. More of these events will be held in the new year, and other efforts are in the works to address the special needs of this time -- countering the naysaying and misinformation that opponents of marijuana legalization have already begun to spread, and highlighting and bolstering the growing international debate on drug prohibition as a whole. I've mentioned in recent emails that we offer a number of books, videos and other items to our donating members. Some of the older items are available with gifts of as little as $15. The most recent books or videos come with donations of $35 or more. (Note that selecting gifts will reduce the amount of your donation that is tax-deductible.) Of course I hope you will consider donating more than the minimum if you are able, or supplementing your donation with a continuing monthly gift. Or if the gifts are not important to you, I hope you'll consider sending a donation that's just for our work. But we'll be pleased to send you any of our currently in stock items at you request. At a time like this -- when people are talking about drug policy like never before -- the movement and our part in it are also more important than ever before. So please support our work with a generous donation today. 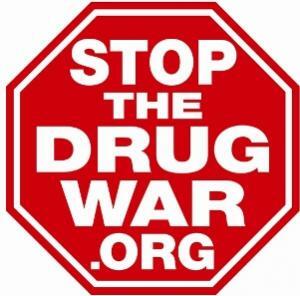 Donations to our organization can be made online at http://stopthedrugwar.org/donate, or they can be mailed to: DRCNet Foundation (tax-deductible), P.O. Box 18402, Washington, DC 20036; or Drug Reform Coordination Network (non-deductible for lobbying), same address. If you wish to donate stock, the information to give your brokerage is Ameritrade, (800) 669-3900), DTC #0188, and account number 781926492 for tax-deductible gifts or 864663500 for non-deductible gifts -- make sure to contact us if donating in this way. Thank you for standing with us to stop the drug war's cruelties and meet the opportunity this time offers to make a brighter future. As recent events show, Time, and the truth, are on our side!